Approved on September 15, 2014, this new standard has replaced HBR2 in 2015. 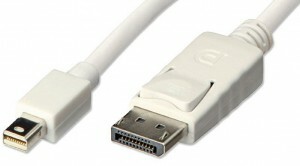 High Bit Rate 3 (HBR3) is the new standard used by the all new DisplayPort 1.3 video cards. The data bandwidth represent the maximum information (in gigabytes per seconds) each version of DisplayPort can send to the output. Because of this shared bandwidth, it is possible to connect many monitors of different make, model, resolution and refresh rate on each cable. The total bandwidth of High Bit Rate 3 connections is 32.4 Gbit/s, the Video Data Rate being 25.92 Gbit/s. & all lower resolutions and the ones in between. There is a maximum number of monitors that can be connected to any card, so be sure to check in your owner's manual. & a variety of mix and match resolutions like one 2560 x 1600 and two 1920 x 1080, etc, as long as the total resolution is below the total bandwidth available.